1School of Nutrition and Dietetic, Faculty of Health Sciences, University Sultan Zainal Abidin (UniSZA), Gong Badak Campus, Kuala Nerus, Terengganu, MALAYSIA. 2Faculty of Medicine, University Sultan Zainal Abidin, Medical Campus, Jalan Sultan Mahmud, Kuala Terengganu, Terengganu Darul Iman, MALAYSIA. 3Centre for Continuing Education (CCE), Universiti Sultan Zainal Abidin (UniSZA), Gong Badak Campus, 21300 Kuala Nerus, Terengganu, MALAYSIA. 4Institute for Community (Health) Development, Universiti Sultan Zainal Abidin (UniSZA), Gong Badak Campus, 21300 Kuala Nerus, Terengganu, MALAYSIA. Objective: P. granatum is one of the oldest edible fruits of tropical and subtropical regions. This fruit had high antioxidant contained by hydrolysable tannins and anthocyanin compounds that give many health benefit properties. This study aims to quantify and optimized anthocyanin from P. granatum extract. Methods: A total of 50g of the flesh was soaked into two different polar solvents; water and 50% ethanol within a ratio of 1:10; w/v for 24-hr. Then, three different methods of extraction were done and test each with HPLC analytical, respectively. Results: The validated method proved to be linear in the range of 5 – 30 ug/mL and with LOD and LOQ determined respectively for Cy3, Cy3, 5, Pg3, and Pg3, 5. The method also shows recovery (%) close to 100 when accuracy was accessed. For samples, blender water extract had a higher composition of Cy3, Cy3, 5 and Pg3, 5 (22.77 ± 8.82 mg/100 g e.p; 25.36 ± 9.95 mg/100 g e.p; 11.16 ± 5.85 mg/100 g e.p) content as compared to other. Conclusion: As a conclusion, the present methodology proved to be capable of detecting and quantifying Cy3, Cy3, 5, Pg3, Pg3, 5 in a single run. Also, comparatively the composition of each AC detected in blender water extract is significantly higher in value than the other methods. It should regard as a valuable source of antioxidant with the potential used for health benefits properties worldwide. Norhaslinda R, Noratiqah JM, Amin BA, Khalili RM. 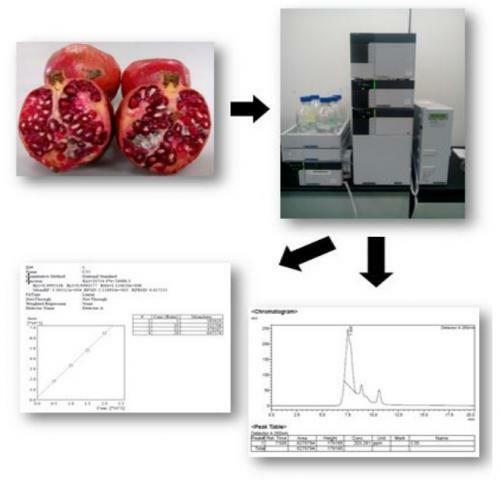 Quantitative and Optimization of Anthocyanin Extracted from Pomegranate (Punica Granatum) Extract by High-Performance Liquid Chromatography (HPLC). Pharmacognosy Journal. 2018;10(4):650-653.